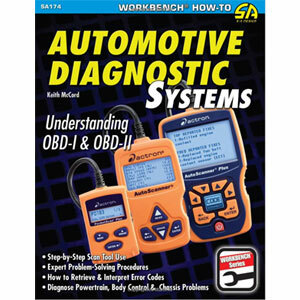 Automotive Diagnostic Systems: Understanding Obd I & Obd II by Keith McCord is a book designed for anyone who wants to work on the motor car of today, from the professional motor mechanic to the DIY enthusiast, this book will guide you through the complexities of using a diagnostic scanner via the vehicle on board diagnostic port. The book describes the history of automotive on board diagnostic systems, from the original Obd I to the present motor industry standard Obd II. Detailed explanation of the system is provided, describing the all the features and capabilities and full instructions are given in a clear and concise language that even the beginner will understand. This book is recommended as an easy reference guide for anyone wanting information on using a diagnostic scanner.